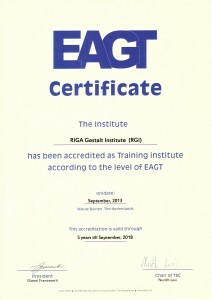 R iga Gestalt Institute (RGI) was founded in 1999 as a school project for the training of specialists in the field of Gestalt therapy. RGI founder and director is Arthur Dombrovsky. Then and now, we take as the basis of our business philosophy, theory and practice of Gestalt approach to psychotherapy. However, it is essential for us – it is the humanistic values of philosophy and psychology. In this case, the activities and the work of RGI and its employees is based on the scientific validity and the methodological and professional activity. 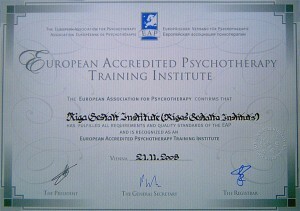 RGI is a member of the European Association for Gestalt Therapy (EAGT) and the International Federation of teaching the Gestalt (FORGE). 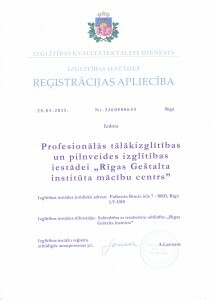 RGI program is consistent with international standards of the European Association for Psychotherapy (EAP), the Latvian Association for psychotherapy (LPB) and EAGT. In their professional activities, we adhere to the definition of psychotherapy, formulated in Strasbourg Declaration on Psychotherapy and our activities are governed by a code of ethics RGI. 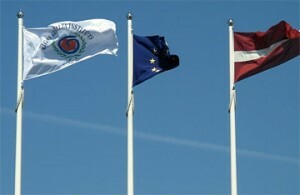 We cooperate with many Gestalt institutes in Europa. Since 2001, the RGI are regular conference under the title “Human Dimension”, reflecting the creative and professional interests of RGI. Also, since 2003, runs a summer open seminar – Residence, which, as well as a conference, everyone can visit and learn more about Gestalt therapy, a course of personal growth, and just have a good time with nice people. Residence is held for 7 days in a beautiful part of Latvia. At Residence works RGI staff and students, as well as experts from friendly gestalt institutes. In addition to the training project in RGI conducted various seminars for personal growth and creative development. Specialists, therapists at our institution can receive supervision, both individual and group.